Children’s rights advocates from the Child Rights Network (CRN) reminded lawmakers on Friday to listen to the voice of the people and retain the minimum age of criminal responsibility (MACR) at 15 years old. 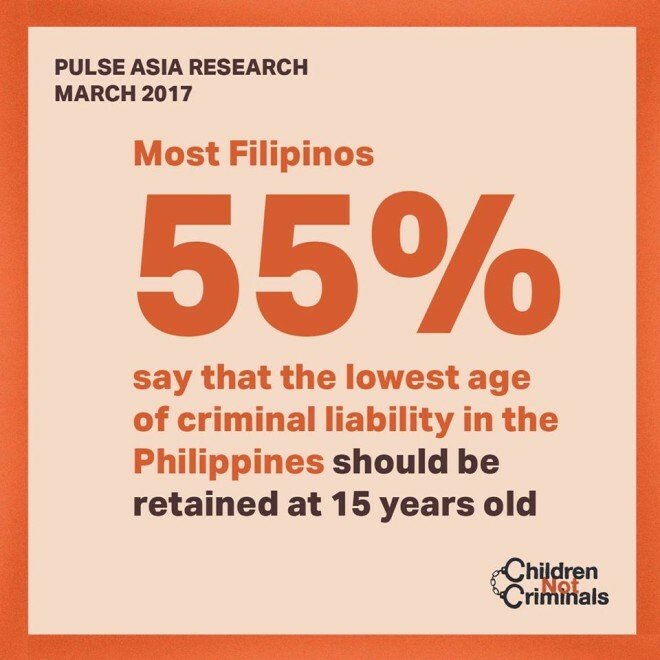 This call was made after the release of the results of Pulse Asia’s March 2017 Ulat ng Bayan Survey, which reveals that majority or 55% of Filipinos believe that the minimum age of criminal responsibility should be retained at 15 years old, while only 9% believe that the MACR should be at nine years old and 20% believe that MACR should be at 12 years old. The results are consistent throughout Luzon, Visayas, and Mindanao and across all socio-economic classes in the Philippines. “We are very glad that the people have spoken and agree that lowering the MACR goes against the best interests of children. We hope that our legislators will listen to the voice of the people, who do not want to see our children go to jail,” said Romeo Dongeto, executive director of Philippine Legislators’ Committee on Population and Development (PLCPD), convenor of the Child Rights Network. Earlier this year, the Child Rights Network and other alliances that advocate children’s rights, including the Philippine Action for Youth Offenders (PAYO), launched a nationwide campaign called #ChildrenNotCriminals to oppose House Bill 2 and five other bills in the House of Representatives (HOR) that seek to amend the Juvenile Justice and Welfare Act in order to lower MACR from 15 years old to 9. Filed by Speaker Alvarez and other allies of President Rodrigo Duterte, the bills are now under deliberation by a technical working group organized by the HOR Committee on Justice. The advocates expressed optimism that instead of lowering MACR, strengthening the implementation of the JJWA—through adequate funding, capacity buildling of implementers, investment in human resource, and public awareness programs—is the more effective, sound, and rights-based solution to the problem of children being involved in criminal activities. “Studies have shown that criminalizing children leads to recidivism. Detention and/or incarceration of children have also been linked to adverse effects on a child’s mental, physical and emotional development, as they are likely to be subjected to discrimination and abuse while detained. Furthermore, jailing children would deny them of opportunities for advancement through education, and future employment,” the groups declared in a previous statement. “Now that we know that the people are on our side, we are more inspired and our voice is stronger. We remain committed to oppose any and all moves to lower MACR. At the same time, we will support all initatives to strengthen the JJWA,” said Melanie Llana, lead of the CRN’s MACR advocacy team and president of Philippine Action for Youth Offenders. It can be recalled that ealier this year, the House of Representatives mounted on its website an online poll on the issue, which generated an overwhelming (or more than 90%) opposition to the current moves in Congress to lower the MACR at nine years old.